Something immediately caught my eye about the Subaru Boxer inline 4-cylinder engine that appears on the inside cover of the November IEEE Spectrum. I cannot find the photo on the Web - maybe it is a concept engine. 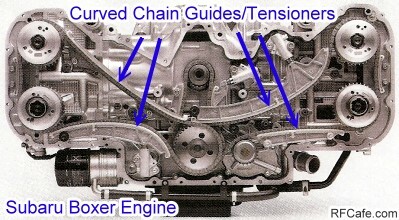 The unique feature is the chain drive system that uses curved guides / tensioners rather than idler pulleys (see pic below). I wonder what kind of surface finish and lubrication can endure 200,000 miles of sliding friction? Nice. Here is an attachment for your cordless drill that I'll bet you don't have yet. DPX Systems has come up with some creative way to demonstrate the utility of their energy adapter drives. Rube Goldberg comes to mind at first when examining the pickup truck winch, wheelchair, mini-bike, etc., with cordless drills hanging off of them, but the quality of the machining suggests otherwise. You have to admire the Japanese for their dedication to advancing the science of robotics - particularly in the realm of being human surrogates. Recently in Kitakyushu, this Tmsuk "telepresence shopper robot" did shopping chores for an infirm elderly woman via commands sent from an NTT DoCoMo video-capable cell phone. Here's a new statement for the lab fashion coterie amongst us. This dress has 436 white circuit boards. Each contains an LED that is operated by a central controller unit, allowing messages and patterns to be displayed. Solar cells power the dress, so its effectiveness in dark party environments could be negligible. An RF receiver accommodates remote control. I assume the dress is Pb-free so eco-warriors will not be compelled to throw paint on the wearer. Now there might be a cell phone for hard-line tree huggers whose consciences heretofore prevented them from owning an awful, e-waste creating device of any sort. The Nokia 'Remade' has a body made of recycled aluminum, plastic and rubber, while the display has been redesigned to minimize environmental impact. Of course the really evil earth-destroying parts - ICs, capacitors, solder, etc. - are still in there. 'Remade' is actually a concept phone and is not commercially available, but will lead to retail versions in 2009. A word of advice: Don't keep any information on your mobile device that you wouldn't want used against you in a court of law. This Universal Forensic Extraction Device "enables police, intelligence forces, military and anti-terror units to extract mobile phone forensic evidence, working in the field as well as in the lab." 11-21-2008 The "paperless office" concept has been an elusive concept, but it moves one step closer to reality with the "Quickies" concept developed by MITs Ambient Intelligence Group. Quickie notes are RFID-enabled Post-it notes that allow their content to be sent directly to computers, cellphones, or other wireless devices. This is a mini version of those wireless white boards used in conference rooms. This laptop computer trackpad by Alps senses your hovering fingers, so contact is not required. Alps says it would be good for sterile applications or public displays. I have to believe it would get annoying in everyday use, kind of like when one of the digital signature pads at the store checkout counter begins tracking the pen before it ever touches the surface. I have to admit that I did not know there is a category in the Guinness Book of World Records for cellphone ruggedness. There is. This JCB 3CX Digger Toughphone is now king of the hill. The record attempt had to be witnessed by independent judges who would act as testers and also verify the height form which the phone was dropped. It was still making calls and sending texts even after the 3.25 meter drop onto concrete. 11-28-2008 So That's Why Apple Recalled the iPhone 3G's USB Power Adapter. I clicked on the link to read about the forensic engineering effort. The technical explanation caught me by surprise and made me laugh out loud. I'll bet you will, too.